What's the BEST way to do a heart chakra meditation? Well, you could practice some esoteric meditation technique, or you could simply allow the power of music to open your heart chakra effortlessly. Consider this for a moment. Music is a language of emotion and it can have a very powerful effect on the way you feel. When your heart chakra is open, you will feel deeply. Love, compassion, centeredness and warmth towards others are all encouraged by an open heart chakra. When these feeling are intensified through meditation on your heart center, you may experience any number of sensations, from ecstatic bliss to tears of joy. You might even shed a tear of sorrow as old hurts are released and are replaced with feelings of love and self acceptance. What better way to give rise to these wonderful emotions and to open your heart than by listening to this beautiful heart chakra meditation music! This music is yours to download and keep, and it's completely free. You can either listen online by playing the video below, or you can download the entire 8 minute track to your computer (instructions below). 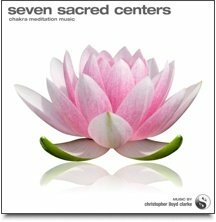 This free chakra music is one of the tracks from Seven Sacred Centers. Please click on the image below for more information. To gain access to this free music download, please subscribe to The Guided Meditation Site. It's 100% free to subscribe, and you can unsubscribe any time you like. Once subscribed, you will receive a welcome email that includes your download link for 'Divine Love' as well as a link to our free guided meditation 'The Blissful Mind Meditation'. Please help us reach more people with this beautiful music by adding a link to The Guided Meditation Site on your website, your social media page or in your blog. We want to share this free music with as many people as we can - and you have the power to make that happen! So if you enjoyed this meditation music then please help us bring it to others. Let's keep this nice and simple. A great heart chakra meditation does not have to be a complicated affair! Close your eyes and bring your awareness to your heart. Feel whatever it is that you feel. There are no right or wrong emotions at this time. Now listen to the music. When I say "listen", I mean "feel as you hear". Absorb yourself in the music, and allow your feelings to flow in whatever way is natural for you at this time. Just let the music take over for the next ten minutes. As you listen, you might like to visualize a flower opening in your chest, or perhaps you might like to imagine that the music is emanating from within your heart. These visualizations may help to make the experience even more vivid for you, however they are not critical to this heart chakra meditation. All that you really need to do is give your attention to the music and allow yourself to feel. When the music finishes, you might like to sit in silence for a few minutes before you go about your day. Give yourself some time to come to down to earth before you get up. We have so much more wonderful music to share with you! Click here to download more long-play meditation music tracks. Feel free to share your thoughts about the music and relate any experiences you have while listening to it. We'd love to hear from you! Want even more free meditation music? Click here! If you liked this heart chakra meditation music, then check out our complete chakra music collection!